Republished April 24 to correct industrial natural gas consumption in the Reference case. 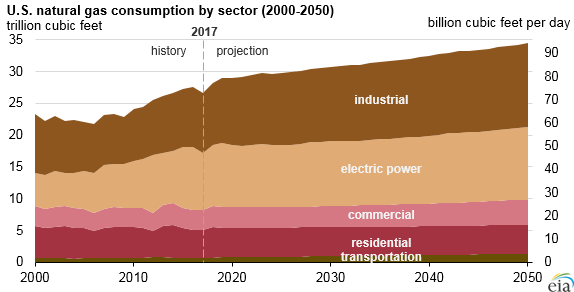 EIA’s Annual Energy Outlook 2018 (AEO2018) projects that U.S. dry natural gas production will increase through 2050 across a wide variety of alternative assumptions about the future. In the Reference case, which is based on current laws and regulations, production grows 59% from 2017 to 2050, starting at 73.6 billion cubic feet per day (Bcf/d) in 2017 and reaching 118 Bcf/d in 2050. In sensitivity cases with different assumptions for natural gas resources and extraction technology, natural gas production also increases through the forecast period, although at different rates. Beyond 2020, natural gas production grows faster than consumption in all cases except the Low Oil and Gas Resource and Technology case, where production and consumption remain relatively flat because of higher production costs. In the High Oil and Gas Resource and Technology case, with lower production costs, natural gas production grows to 151 Bcf/d in 2050, more than double the 2017 rate of natural gas production. Although most of the projected production growth in AEO2018 cases comes from the Marcellus and Utica plays in the Appalachian region, associated natural gas from the Permian region in Texas and New Mexico is also projected to be a significant contributor. In all AEO2018 cases except the Low Oil and Gas Resource and Technology case, EIA projects Henry Hub spot natural gas prices to remain lower than $6.00/million British thermal units (in 2017 dollars) through 2050. Near-term production growth across all cases is supported by growing demand in an environment of low and stable natural gas prices in both domestic and international markets. The AEO2018’s projected increase in domestic natural gas consumption is driven by the industrial and electric power sectors. The U.S. industrial sector, which includes both lease and plant fuel and liquefaction fuel for liquefied natural gas (LNG) exports, currently consumes more natural gas than any other sector, and its natural gas consumption is projected to grow faster than in any other sector. EIA expects a 39% increase in industrial natural gas consumption in the Reference case—from 25.9 Bcf/d in 2017 to 36.1 Bcf/d in 2050. The AEO2018 Reference case projects natural gas to remain the leading source of electricity generation in the United States through 2050, accounting for 35% of electricity generation, an increase from 31% in 2017. Projected natural gas growth in electric power generation is supported by increased competitiveness with renewables after the expiration of renewable tax credits in the mid-2020s and the relatively low forecast natural gas prices throughout the projection. EIA expects natural gas consumption in the residential and commercial sectors to remain relatively flat, despite growth in population, because of efficiency gains in natural gas-consuming equipment such as furnaces, boilers, and water heaters. Continued population shifts away from the colder Northeast to warmer regions in the southern and western United States also reduce overall demand for space heating needs, much of which are currently met with natural gas. After becoming a net natural gas exporter in 2017, U.S. natural gas exports continue to rise throughout the projection period in the Reference case. Both LNG and pipeline exports to Mexico continue to increase because of increased demand from Mexico’s natural gas-fired power plants. However, pipeline exports to Mexico are expected to gradually decrease after 2030 as Mexican energy reforms take hold and Mexican production reverses its current declines. Although LNG exports from the United States increase through the 2020s as more export terminals come online following the opening of the Sabine Pass and Cove Point LNG export terminals, U.S. LNG exports level off as U.S.-sourced LNG becomes less price competitive with increasing LNG supply from other global suppliers.